Q) Are all your Xamarin.Forms controls .NET Standard compatible? A) Yes, all our controls are compatible with .NET Standard. Q) Does Syncfusion offer controls for accessing SQLServer databases, and Excel spreadsheets? A) In Xamarin, you can make use of XlsIO for accessing spreadsheets: https://help.syncfusion.com/file-formats/xlsio/getting-started. Q) We are interested in taking a course on Xamarin—does Syncfusion provide one? A) Our monthly webinars would serve as the closest things to a development course we provide. Please check our YouTube channel for all past webinars. Q) If the PDFs are saved, are they removed automatically or do you need to code the removal? A) Both with PDF class library and PDF viewer control, we won’t remove the saved copy of the PDF documents. They provide support to save the PDF document to stream; at the application level, the user can save it to storage. Q) What is the link to the app used in this webinar? Q) Is there a minimum or maximum API version supported by the controls? A) Yes. Please refer to the following documentation link: https://help.syncfusion.com/xamarin/introduction/system-requirements. Q) How often do you release controls? A) We do four major releases every year and a service package release every month. Q) Is there any roadmap on future new controls for Xamarin? A) Yes. 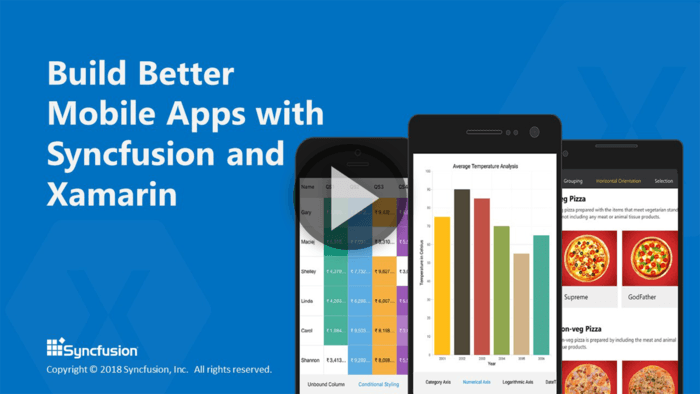 Please refer to this page: https://www.syncfusion.com/products/roadmap/xamarin-formshttps://www.youtube.com/user/syncfusioninc/videos.